First off, I just want everyone to know that Makena did gain some “freedom” on the Fourth of July! We took her out, off leash, for a walk on the 100 acre ranch where we are working for the summer, Luton’s Teton Cabins. She was ecstatic, and did very well running around. Then she spent the rest of the day napping! The next day she was walking just fine, no pain from her running around. So that is a good sign, although we do keep her in the kennel a/k/a “jail” when we go to work. Hopefully the vertebrate in her back are fusing together and she will continue to improve!! We have been working at Luton’s Teton Cabins since mid-May. This is our third summer at the cabins. As we watch the rest of the country suffer with the high heat and humidity, we are happy to be running a space heater at night, when it dips into the upper 30’s, only to warm up into the 70’s during the day. Although this week it has been in the 80’s for three days now. We had to turn the air conditioner on for the first time yesterday! I continue to split my time between the office and cleaning the cabins. Dan has added the job as “laundry guy” on to his cleaning duties. One day a week he is in charge of doing all the cabin laundry. He enjoys the variety, and has mastered the art of folding fitted sheets – Grandma Joan will be proud! Our friends Karen and Al are back for their fifth season, and Shawn and Erin returned for their second season. We have two new couples this year and all together, we have a great, hard-working, drama-free crew. It makes for a pleasant working environment! We have been trying to get out on our off days to do a little bit of hiking and sightseeing. Last fall, the park service in Yellowstone added a new overlook to the Grand Prismatic Spring, one of the prettiest and largest hot springs in the United States. We made an early trip up to Yellowstone to check it out, before the park became overrun with tourists for the summer. It was spectacular. We also hiked over to nearby Fairy Falls, about a four mile round trip hike from the Grand Prismatic. When we arrived, there were eight people already at the Falls. When we left, there were over three dozen people arriving, so we time it perfectly! We did some hiking with Karen and Al on another one of our off days. It’s hard to take “bad photos” when you are in the Tetons. Al was quite jealous of the people on the boat! The rivers are a little murky and very fast right now, so Dan and Al have only tried fishing once and they had no luck – although they say the conditions should be improving very soon. It’s hard to believe it’s July already. This summer is going by fast. I do have a very simple piece of advice for anyone staying at a hotel/cabin/B & B, or any place where there will be housekeeping done. Do not leave your toothbrush right next to the sink! No matter how careful we are, the odds are pretty good that your toothbrush could end up with a small amount of overspray from a cleaning chemical, if you leave it uncovered near the vanity/bathroom sink. Just something to think about next time you are traveling…..! 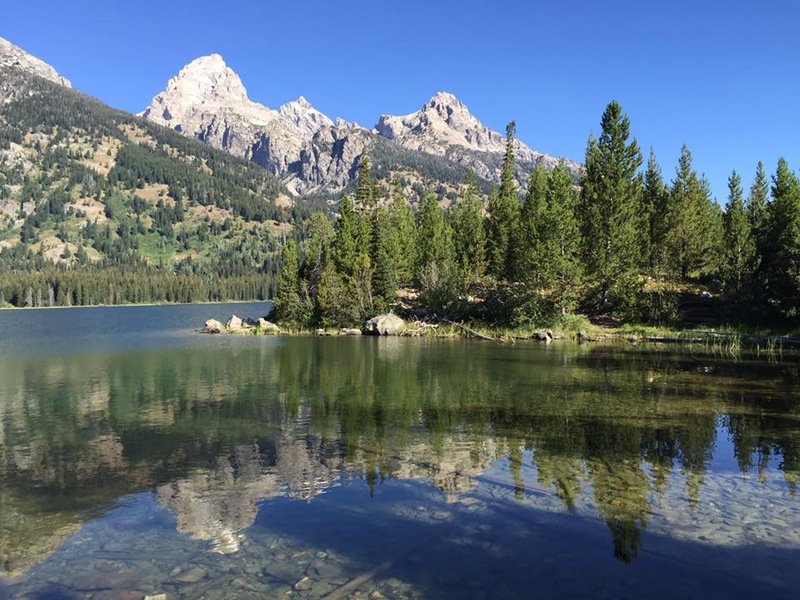 This entry was posted in Grand Teton National Park, Luton's Cabins, Wyoming by liv2rv. Bookmark the permalink. Makena is one happy dog! 😃 Hope she continues to do well. Thanks! It’s all about the dog…when she’s happy, we are happy! Glad to hear that Mak is doing better. Great pics ,you guys ! Thanks Jerry. Hope you are staying out of the heat. It’s great that you are able to spend a lot of time with your family. That’s important. We hope you are safe from the fires and heat. Take care! I will remember the toothbrush thing! Sounds like you are having a great time. Things are improving here. Still very windy and many days are overcast but when the sun is out, it is really breathtaking. Miss you.